Two-way streets that turn one-way during certain times. Since I took this picture as a pedestrian on the corner, it's not quite the perspective you'd have as a car ... in that case, you would be about 15 feet to the right from where I took it. But this still illustrates the point. From 4 to 6 pm, you CANNOT make a right turn. It's one-way going the other way during rush hour. This is a pretty low-visibility sign to prevent a driver from trying to swim "upstream" against the usual nasty horde of other DC drivers. If you look at the first picture, there's a lot going on there, and the one-way indicator really doesn't stand out. But the point of this post is not to highlight one particular poorly-marked intersection. 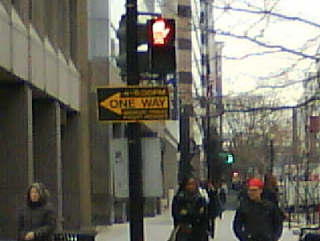 This street is not an oddity; there are LOTS of time-dependent one-way streets in DC, subtly marked by those black and yellow signs. Do these exist anywhere else? A few minutes of googling turned up nothing; they appear to be unique to the DC area. 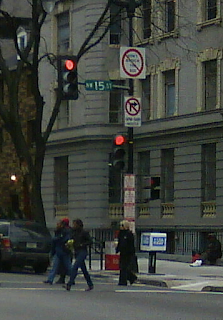 Were I a visitor in the DC area during rush hour, the existence of these signs sure would make life difficult.